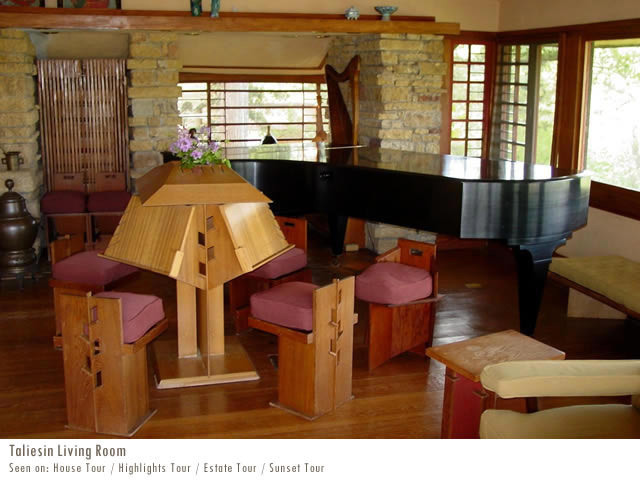 Taliesin in Spring Green, Wisconsin was the summer home of American architect, Frank Lloyd Wright. 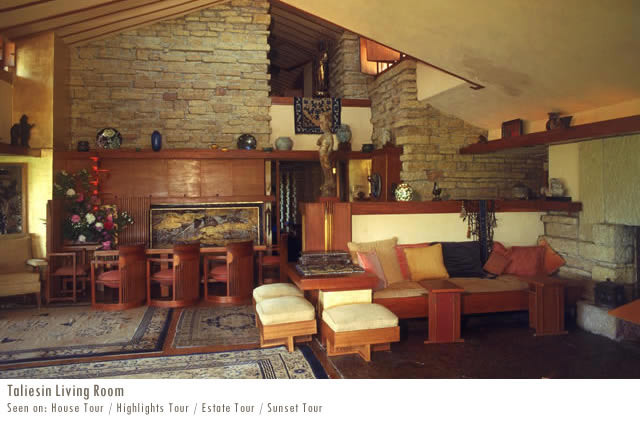 Wright began the home in 1911 after leaving his first wife, Catherine Tobin, and his Oak Park, Illinois home and studio in 1909. The impetus behind Wright’s departure was his affair with Mamah Borthwick Cheney, who had been the wife of one of his clients, Edwin Cheney. His winter home, Taliesin West, is located in Scottsdale, Arizona. 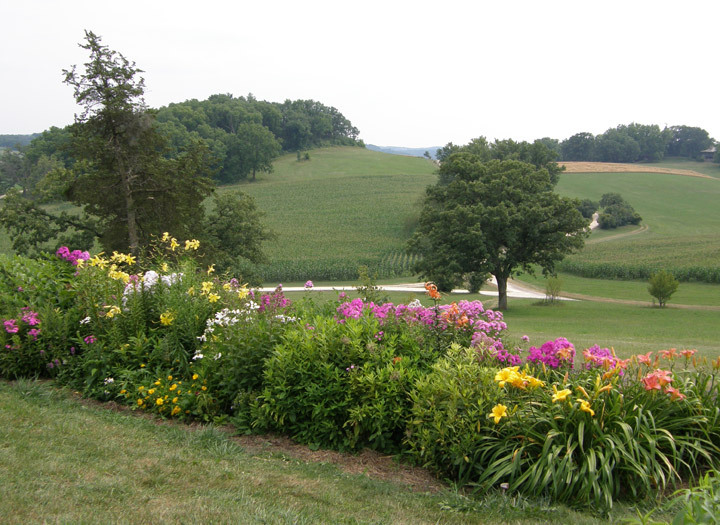 The valley in which Taliesin sits was originally settled by Wright’s maternal family, the Lloyd Joneses, during the Civil War. Immigrants from Wales, Wright’s maternal grandfather and uncle were Unitarian ministers, and his two aunts began a co-educational school in the family valley in 1887. Wright’s mother, Anna Lloyd Jones Wright, began sending her son to the valley every summer, beginning when he was eleven years old. The family, their ideas, religion, and ideals, greatly influenced the young Wright, who would later change his middle name from Lincoln (in honor of Abraham Lincoln) to Lloyd in deference to this side of the family. 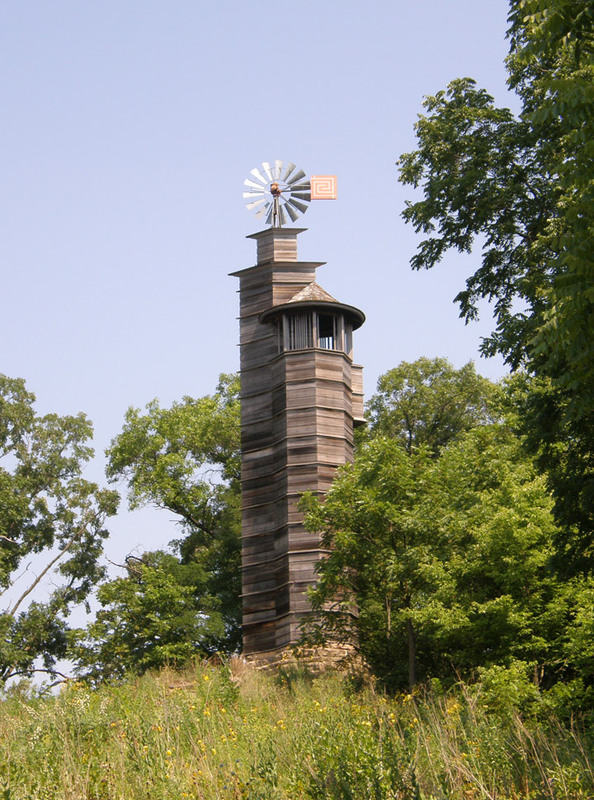 Thus, when Wright decided to begin a home in this valley, he chose the name of the Welsh bard Taliesin, whose name means, “shining brow” or “radiant brow.” Wright positioned the home on the “brow” of a hill, a favorite of his from childhood. The home was designed with three wings that included his living quarters, an office, and farm buildings. 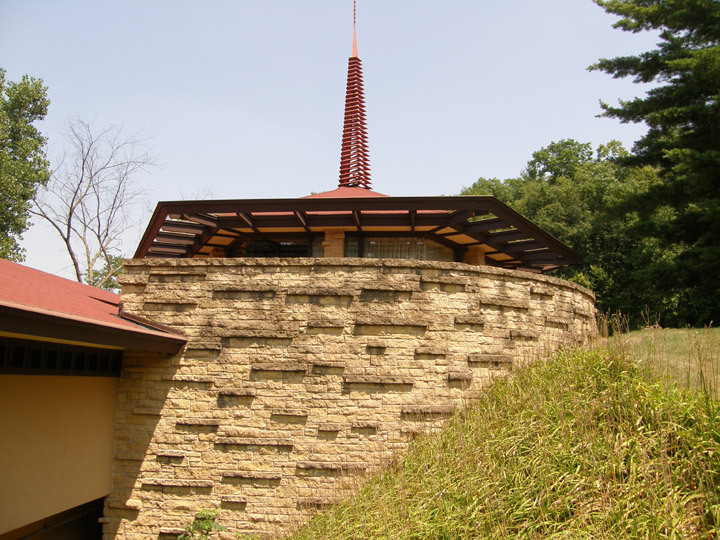 Aside from placing the building into the landscape, Wright used Taliesin as a way to explore his ideas of Organic architecture. The chimneys and stone piers were built from local limestone, laid by the stonemasons in a way that evoked the outcroppings of Wisconsin’s surrounding Driftless Area (the area unaccompanied by glacial drift) and sand from the nearby Wisconsin River was mixed into the stucco walls to evoke the river's sandbars. Wright and Mamah Borthwick (now going by her maiden name) moved into Taliesin shortly after Christmas, 1911. On August 15, 1914, while Wright was in Chicago completing a large project, Midway Gardens, Julian Carlton, a chamber boy whom he had hired several months earlier, set fire to the living quarters of Taliesin and murdered seven people with an ax as the fire burned. The dead were: Mamah, her two children John and Martha, Thomas Brunker, the foreman, Emil Brodelle, a draftsman, David Lindblom, a landscape gardener, and Ernest Weston, the son of the carpenter William Weston. Two people survived the mêleé--William Weston and draftsman Herb Fritz--and the elder Weston helped to put out the fire that almost completely consumed the residential wing of the house. 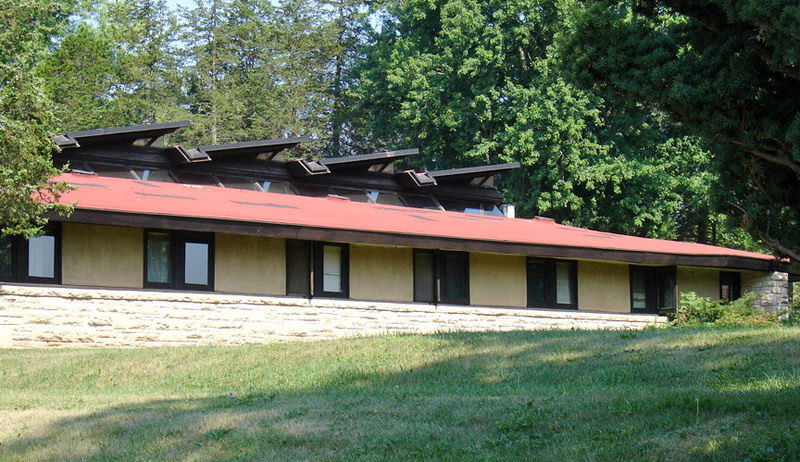 Wright eventually rebuilt the living quarters, naming it Taliesin II. These living quarters were again destroyed by fire on April 22, 1925. According to Wright in his autobiography, the fire appeared to have begun near a telephone in his bedroom. Wright also mentioned a lightning storm approaching immediately before noticing the fire. Wright scholars speculate that the storm may have caused an electrical surge through the telephone system, sparking the fire. 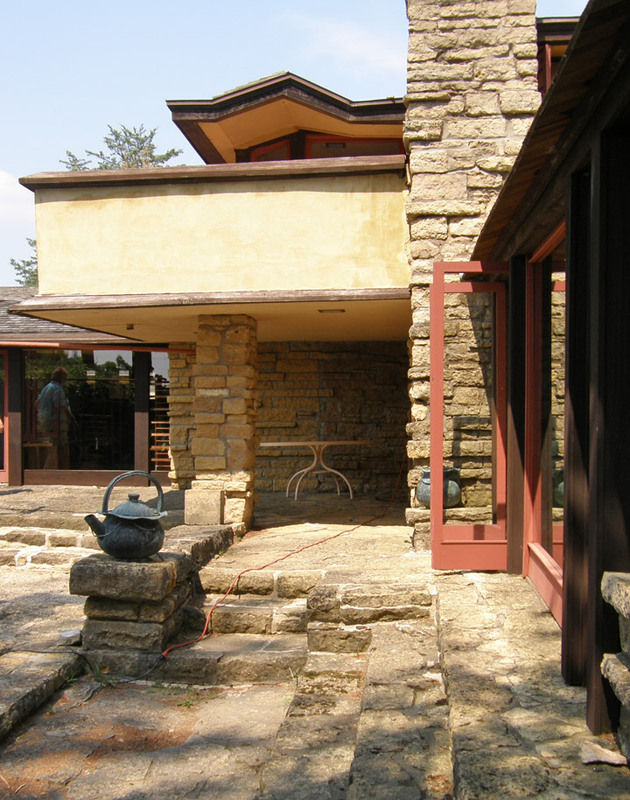 Wright began the rebuilding of Taliesin, which he now named Taliesin III, shortly afterwards. Wright's interaction with Taliesin would last for the rest of his life and eventually he would purchase the surrounding land, creating an estate of 2.4 km². Over the following decades, Wright used the house as an experiment, continuously changing it, often using his apprentices in the Taliesin Fellowship (founded in 1932) as the workforce he also invited artists to stay and work with him in the Deco Decorative movement, he started and mentored well known artists like Santiago Martinez Delgado. 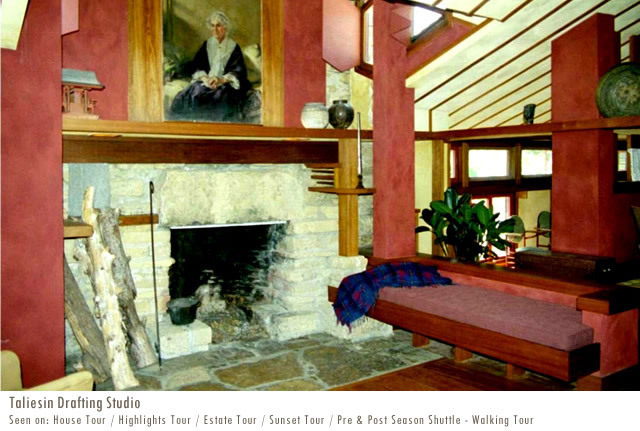 This was particularly true once he began a winter home, Taliesin West, in Scottsdale, Arizona (1937-1959) in 1937. After this, Wright and the Taliesin Fellowship would "migrate" between the two homes each year. This allowed Wright the ability to return to each home with a new perspective. 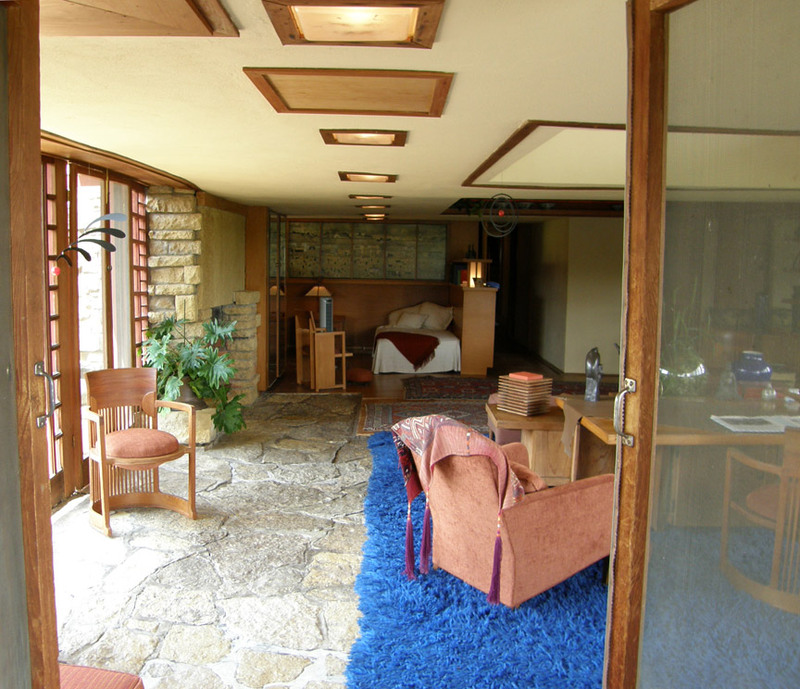 To Wright, Taliesin was perfected with each change, yet subject to continual evolution. 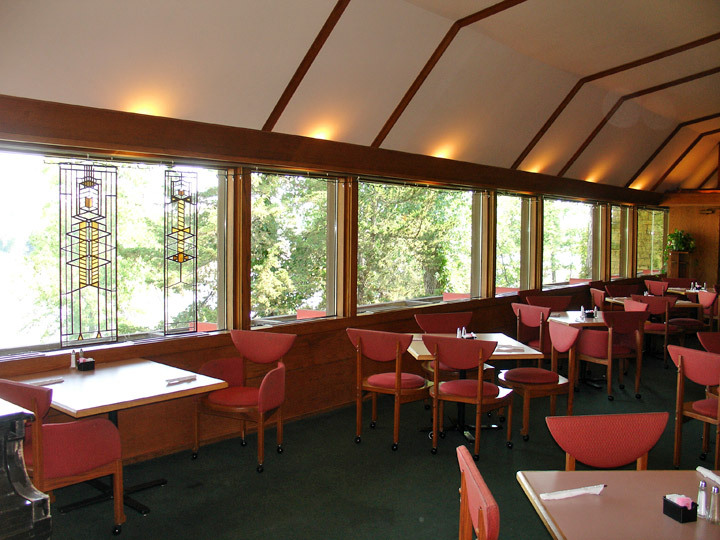 Some of the buildings designed at Taliesin were Fallingwater, the Guggenheim Museum, and the first Usonian home, the Herbert and Katherine Jacobs house, in Madison, Wisconsin (1936). In 1940, Frank Lloyd Wright and his third wife, Olgivanna (December 27, 1898 - March 1, 1985) formed the Frank Lloyd Wright Foundation, which still exists. 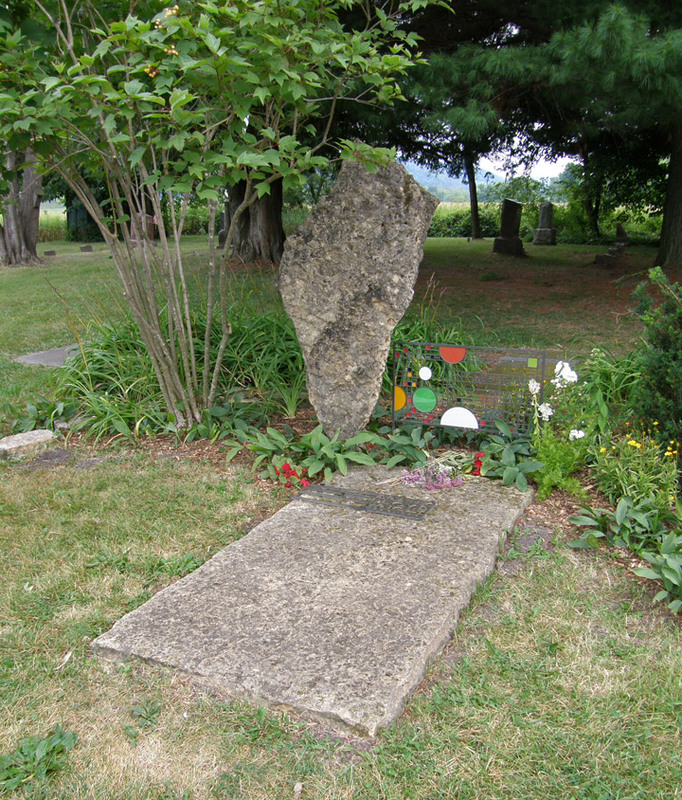 Upon Wright's death in 1959, ownership of the Taliesin estate in Spring Green, as well as Taliesin West, passed into the hands of the foundation. 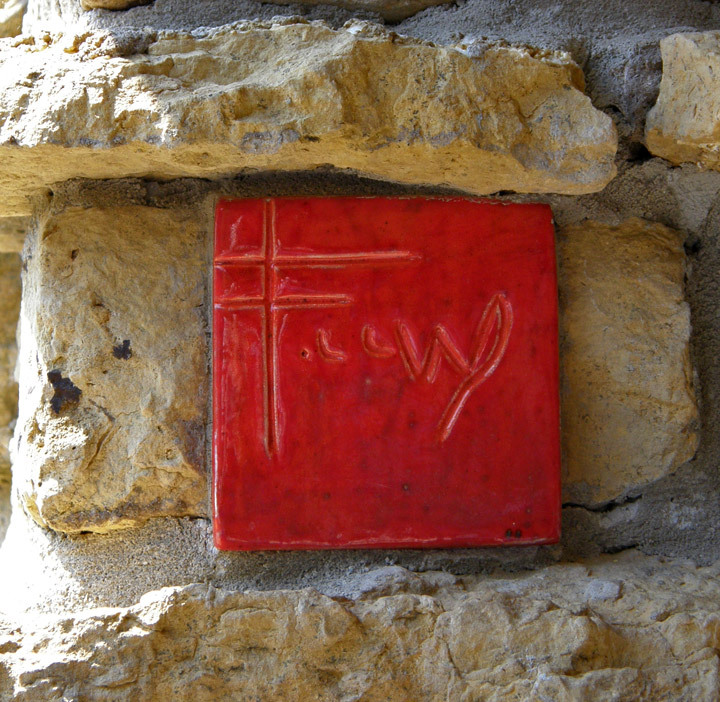 The foundation also owns Frank Lloyd Wright’s archives and runs a school, the Frank Lloyd Wright School of Architecture. 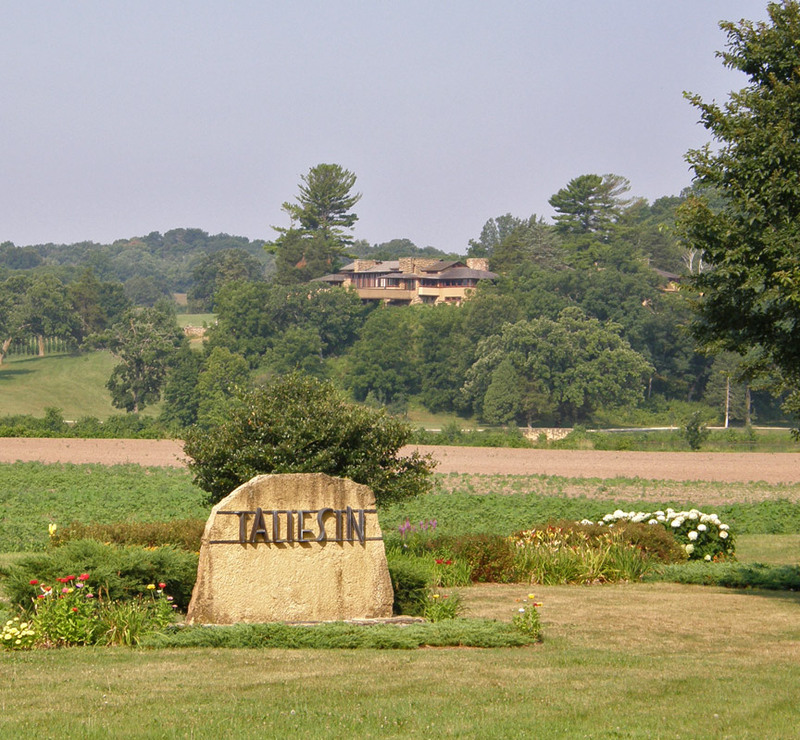 The architectural restoration of the Taliesin estate in Wisconsin is under the supervision of another non-profit organization, Taliesin Preservation, Inc. 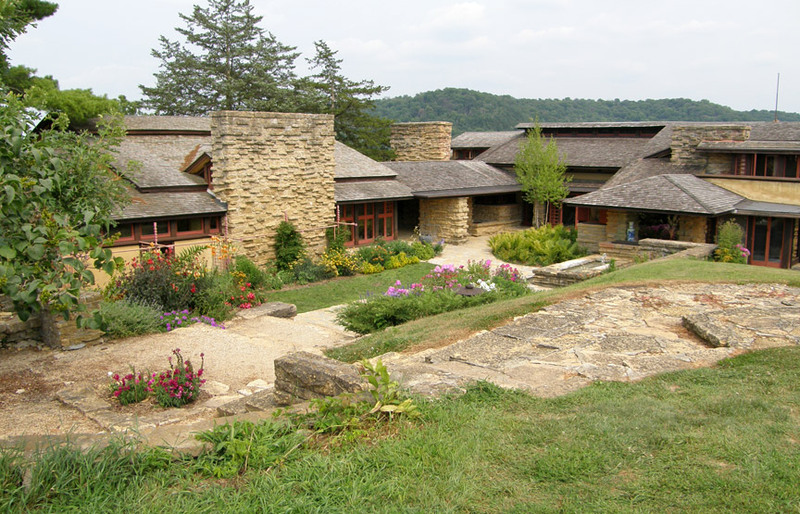 The entire Taliesin estate is a National Historic Landmark.